improved programs for the prevention of illness and injury on board and the effi cient treatment of seafarers’ medical issues when these do occur. Filipino seafarers to add to the data. Once collated and ana- lyzed, newly secured conclusions will be released to industry. As many as 25,000 crewmembers are under the Future Care umbrella at this time, with quality operators such as Teekay (120 vessels), Genco and General Maritime among their cli- ents. As MLC talks about enhanced healthcare solutions, other shipowners are being encouraged to provide a medical fi rst re- sponse plan. 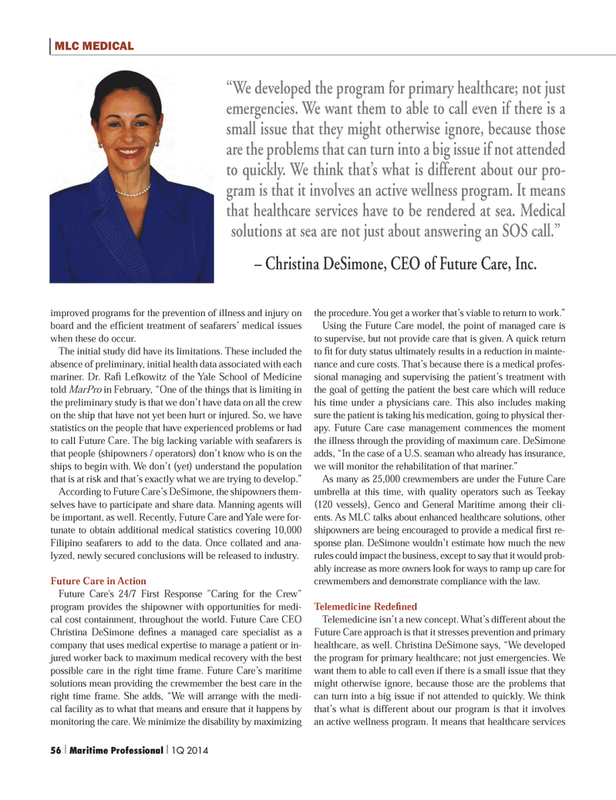 DeSimone wouldn’t estimate how much the new rules could impact the business, except to say that it would prob- ably increase as more owners look for ways to ramp up care for crewmembers and demonstrate compliance with the law.